We have just released our 2017 Summer Camp dates. Click here for more information and to download our registration form. Just released: Our summer camp 2015 dates and details! Gather your friends and join CFCE for THE best Ladies day in Northern Colorado, Shopping Extravaganza, Outlets at Loveland, Loveland, Colorado, I-25 Exit 257, on October 18, 2014 - See ad here. Shop, Save and help raise money for CFCE. At Shopping Extravaganza, you’ll receive exclusive discounts to Outlets at Loveland stores while enjoying a delicious lunch, dessert bar, manicure, chair massage and a chance to win over $10,000 in prizes (no purchase necessary, $1 suggested donation for additional prize drawing tickets, 100% of proceeds from drawing ticket donations go to participating charities)! Event Tickets are just $20, and 50% of the ticket sale proceeds will be donated to CFCE. If you would like several tickets to sell to friends, family, co-workers and/or neighbors to help support CFCE, contact Kirsten at 970-667-0348 for more information. Purchase tickets online at https://shoppingextravaganza2014.eventbrite.com/ and choose "Colorado Foundation for Conductive Education" from the drop-down menu as the charity you wish to support! Your tickets will be available at will-call in the registration area on the day of the event - Saturday morning, October 18th from 10am - noon! Want to pay by cash or check? 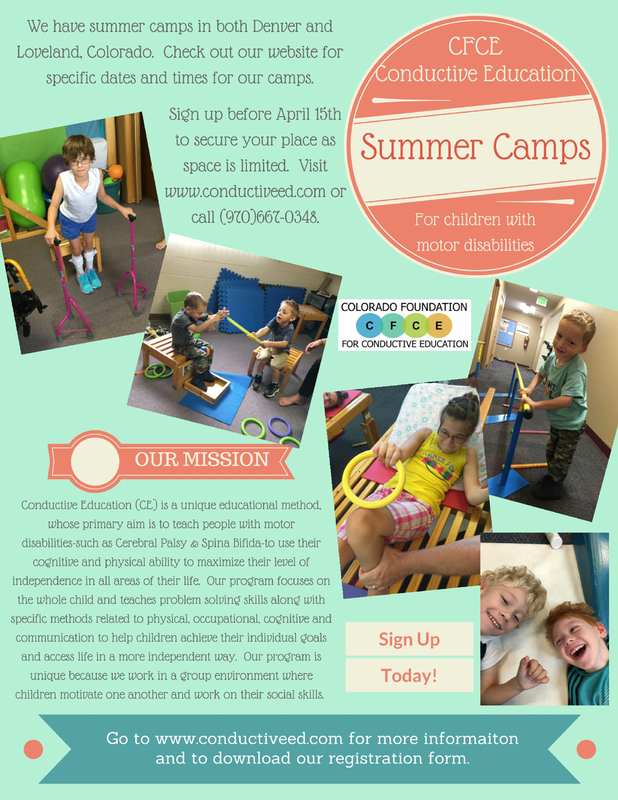 Contact Kirsten at the office at 970-667-0348 or admin@conductiveed.com. Tickets can also be purchased the day of the event at the registration area. Please consider supporting CFCE in this event. We really need your help and the help of your family, friends, neighbors and co-workers! Please pass this information on and ask them to come join us for what will be a fun day of fundraising. 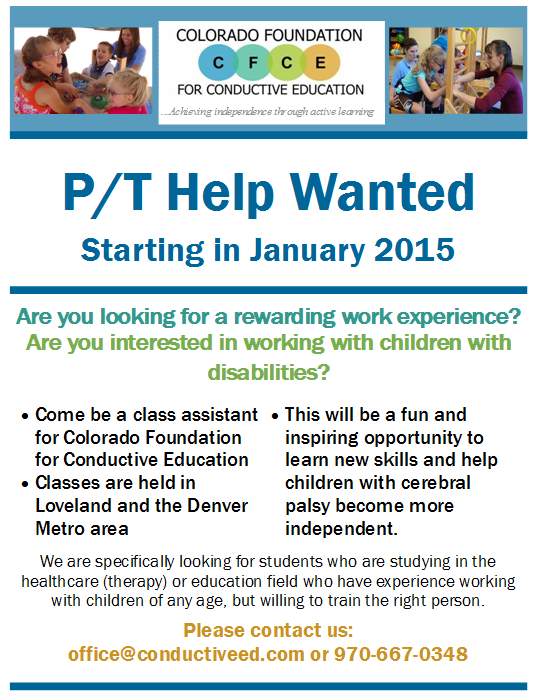 Contact the office at 970-667-0348 or by email at admin@conductiveed.com if you are able to help us in any way. July's Summer Camp in Loveland kicked off today. We have 9 children attending this 4 week extensive camp to work on their individual goals in becoming more independant. The 5th Annual CFCE Golft Tournament took place today! Lots of hard work in preparation and generous supporters made for a very successful and fun event. Thank you to everyone who had a part in the planning and to those who participated! Our Denver Summer camp started today. The children will be attending for 4 weeks Monday - Friday for an extensive camp that is sure to help them move towards their individual goals. Oh, and they have lots of fun with friends, too. It's time to register for CFCE's 2014 summer camps being offered both in Denver in June and in Loveland in July. Please see the link below for the 2014 Summer Camp Information and Registration Form. If you would like further information about Conductive Education and what the camp will entail, please do not hesitate to contact us for this information. We need to know well in advance who is seriously interested in signing their child up for camp this summer as hiring Conductors for each camp needs to be done months in advance to allow time to process visa applications and arrange flights and hotels. If you would like for your child to attend a camp, please complete and return the registration form included in the link below by February 28, 2014. A non-refundable deposit will be due at that time as well. We are excited to lauch our Fall Fundraiser. Consider doing your holiday shopping right here to benefit CFCE! You will find all of the great items detailed here. Click the link now to see we are offering new 2014 calendars, our cookbook, note and Christmas cards, including some new designs, Christmas ornaments with a new design for 2013 and PartyLite candles. Proceeds from all items sold will go towards CFCE's general fund to help keep the student tuition costs low and affordable. Gather your friends and join CFCE for THE best Ladies day in Northern Colorado, Shopping Extravaganza, Outlets at Loveland, Loveland, Colorado, I-25 Exit 257, on October 19, 2013 - See ad here. Purchase tickets online at https://shoppingextravaganza2013.eventbrite.com/ and choose "CO Foundation for Conductive Education" from the drop-down menu as the charity you wish to support! Your tickets will be available at will-call in the registration area on the day of the event - Saturday morning, October 19th from 9am - 11am! Classes resume at both centers. The second of 2 Denver summer camps begins today under our conductor, Renata! Great to have you back again this summer, Renata! Our Loveland summer camp begins today. Our conductor, Agnes, will be working with as many as 7 children for a 4 week camp. Can't wait to see their progress! Today is our annual golf tournament! Thank you to all of our players, sponsors, donors, volunteers and families! We could not hold such an important event without each and every one of you! We welcome Pearl, our conductor for our first summer camp in Denver! She is working with children ages 2-5 for 2 weeks. We are so excited to have you! Space is still available in our summer camp programs. Links to more information for the Denver and Loveland camps are posted above or you can contact the office at 970-667-0348. We are excited to announce our summer camps both in Denver in June and July and in Loveland in June and July. Children can attend anywhere from two weeks to eight weeks of camp. Please see the links below for the Loveland and Denver Information Sheets which include specifics on each camp and a registration form. If you would like further information about Conductive Education and what the camp will entail, please do not hesitate to contact us for this information. We need to know well in advance who is seriously interested in signing their child up for camp this summer so that we can arrange to hire Conductors and staff members for each camp to cover the number of children attending. If you would like for your child to attend a camp, please complete and return the registration form included in the links below by March 28, 2013. A non-refundable deposit will be due by March 28, 2013. In April, you will receive a bill for the remaining balance due. Your balance will be due on or before the first day of camp. If CFCE has to cancel a camp session due to lack of participation, the deposit will be refunded. This is the only circumstance for which a deposit refund will be given. We are working on the last details for our 2013 Summer Camps! Watch for more info to be posted soon. Happy New Year everyone! We are settling back into our regular routine here at CFCE with classes at both the Loveland and Denver centers. And the highly anticipated ski days and golf tournament are fast approaching. Watch for more news and details in the weeks ahead. We have set two Brekenridge Outdoor Education Center (BOEC) Ski Days for the CFCE children. We are taking 12 children on a ski day on January 12th, 2013 and 10 children on March 2nd, 2013. The Ski Program thru BOEC offers adaptive lessons using stand-up, bi-skis, monoskis, and snowboards-all adapted to the individual’s unique abilities, as is the lesson itself. The kids are looking so forward to going. Now if we can just get some SNOW! For more details, take a look at the following Newsletters. SAVE THE DATE -- June 6, 2013!! CFCE's 4th Annual Golf Tournament has been set. Click here for more info. Mini Camp in Denver with Pearl was super fun and productive. Thanks Pearl! See an article and pictures in our Fall 2012 Newsletter above. Our July Summer Camp is underway. We are thrilled to have Renata Toth, a conductor from New Zealand, here for another great month! We have 6 children participating in camp this month. The Golf Tournament was very successful. We are so pleased with the outcome as we raised more money this year than in years previous. Watch for details forthcoming on our next fundraiser. June Summer Camp is going well! We are so pleased to have our conductor, Renata Toth, and her family here from New Zealand. 7 children are attending camp and are loving it. July summer camp. July 1 thru the 29th, 2011. Thursday, June 16, 2011. The 2nd Annual CFCE Golf Tournament was held at the Inverness Golf Club in Englewood, CO. Once again, the fundraiser was a huge success. Watch for the tournament newsletter to come to your email address very soon. June summer camp - June 1 thru the 28th, 2011. CFCE held a Christmas Challenge Camp from Dec. 20-23 & Dec. 27-30. We had fantastic attendance, and the children got to achieve a number of personal goals during this 8 day camp. Each child also had a personal challenge, which they performed to their family on the last day of camp. Everyone worked very hard and had a fun, challenging time. Friday, Nov. 12 (6pm-8pm): CFCE will host an art exibit, sale and silent auction at the Loveland Art Gallery. Art work created by the students at CFCE will be sold. We will also host a silent auction fundraiser. All proceeds will benefit the programs at CFCE. 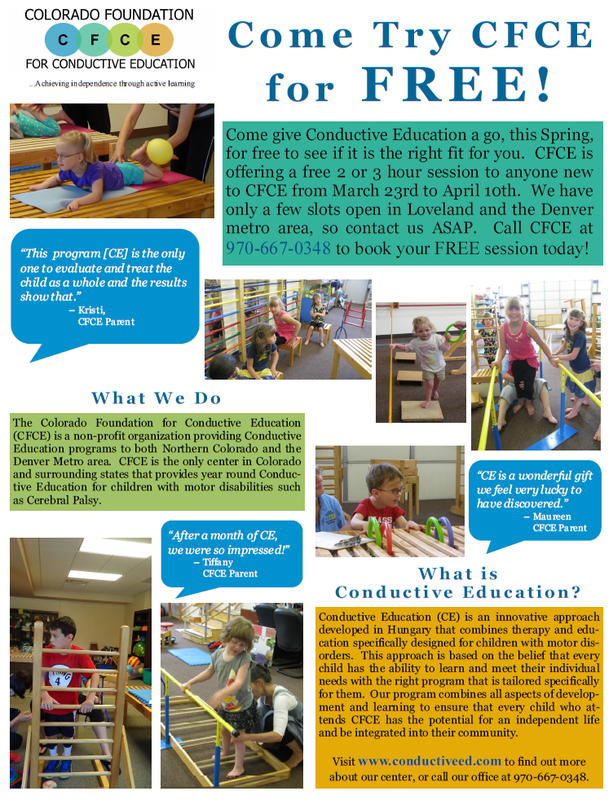 Oct. 2: Open House - CFCE opened our doors to welcome in interested families to see what Conductive Education is all about.